Want to know how to achieve trauma-free dental visits for your kids? It’s a compelling question that prompted Dr. Allan R. Pike to revolutionize his treatment approach with frightened, unwilling children, and write a book titled: Pediatric Dentistry: Building A No-Fear Practice. Dr. Pike, an innovative pediatric dentist with four decades of private-practice experience, developed a treatment model that replaces outdated methodologies for working with children who are fearful and uncooperative during dental visits. Dr. Pike presents evidence-based research and testimonials to explain the problems caused by forceful, authoritarian tactics used to treat difficult pediatric dental patients. To remedy and ultimately eliminate a child’s fears, Dr. Pike advocates a no-force policy in favor of practical techniques centered on winning the child’s trust, building their self-confidence, and gaining their willingness. You can purchase Dr. Pike’s book on Amazon. While turning an unwilling patient into a willing one does not happen at the same pace for every child, Pike demonstrates how dental visit behavior management techniques applied during childhood play an enormous role in forming a person’s perceptions in adulthood. Committed to finding a better way, Dr. Pike developed and implemented solutions fostering positive dental visit experiences by allowing children to see and understand what to expect beforehand and to have a voice during a procedure. His work shows how individuals with positive dental visit experiences during childhood are less likely to avoid oral health care as adults. Ever mindful of the long-term risks if children aren’t treated respectfully and given control over what happens during the visit, Dr. Pike illustrates how traditional behavior management techniques came about and his reasons for abandoning them. Other helpful information for parents and pediatric dental professionals alike includes Pike’s outlay of the field’s financial drivers and how he restructured his fee schedule to support his new model. Pike also offers tools such as a script to guide parents in what to say to their child. There’s a scenario describing what a parent and an apprehensive child experience under Dr. Pike’s care. And, there are procedural explanations such as how to administer a painless injection to a child. Pike’s alternatives are worth careful consideration; his call for change to delivery of trauma-free pediatric dental care is convincing. 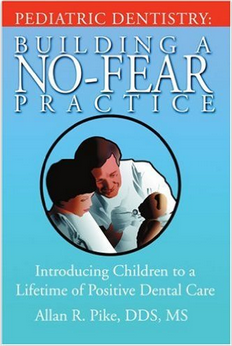 Purchase Dr. Pike’s book, Pediatric Dentistry: Building A No-Fear Practice on Amazon.